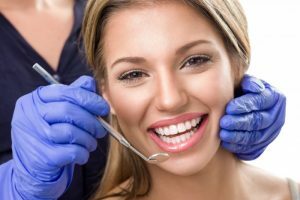 Can a Cosmetic Dentist in Eugene Help You in 2018? Are you dreading spending 2018 feeling self-conscious about your teeth and gums? Don’t let another year pass by without feeling as confident as you should with the teeth that smile back at you in the mirror. Instead, you can take this time to learn about the procedures and treatments available from your cosmetic dentist in Eugene. Whether you just want a brighter smile or straighter teeth—maybe both—you can accomplish those goals and make the most out of the new year! When you look at yourself in the mirror, do you feel less than great about yourself? You can boost your self-esteem by improving your appearance—starting with your teeth and gums. In fact, since your teeth are one of the first things that people notice, making cosmetic improvements one of the best ways to improve your aesthetics in 2018. Explore your cosmetic options from your Eugene dentist. Teeth may change colors depending on our lifestyle habits and what we eat and drink. You can restore the white smile you really want for the new year with professional teeth whitening—either in our office or at home with Zoom2 teeth whitening! After just one appointment, you’ll see a drastic change in your smile for the better. Using a tooth-colored composite resin material, your dentist can work to improve the appearance of your teeth in a quick and cost-effective way. The dental material is smoothed onto teeth and bonded to cover chips, cracks, or other minute smile flaws. Porcelain veneers allow you to drastically transform the appearance of your teeth without having to undergo multiple cosmetic procedures. They are thin sheaths of dental porcelain that fit over the fronts of your teeth, masking your most unwanted imperfections. This minimally invasive procedure can cover chips, cracks, gaps, and even help make your teeth look a bit longer! Your dentist can restore your dental health with tooth-colored fillings. These fillings blend seamlessly within your smile rather than their counterpart, metal fillings. The cavity is filled with composite resin that is highly customizable to match the shades of your surrounding teeth. With a tooth colored filling, you’ll forget that you even had a cavity to begin with! Do not spend another year feeling insecure how your smile looks. Improve your overall look and stop second guessing yourself in 2018 after you receive cosmetic care from our office! Here at the dental office of Dr. Ben Sutter, we’re proud to offer the services you need to feel great about yourself. One of our favorite things to do is boost our patient’s confidence with quality, long-lasting dental care. Give us a call today to learn more about how we can help you! Comments Off on Can a Cosmetic Dentist in Eugene Help You in 2018?